@Lion.Kanzen I am not sure, does body measures matter when you design unit models? If they don't matter we don't need to research them. @Lion.Kanzen I am not sure does body measures matter when you design unit models? If they don't matter we don't need to research them. Yes but you are re-design whole body set? That's very ambitious. @Lion.Kanzen My/our goal is to help artists, modelers and developers by providing documentation for buildings, units and the look and feel of the Kushites. That is the whole purpose of the specification document: https://github.com/Jeeppler/kushites_mod/blob/master/docs/build/specification.pdf. However, I have no idea how you model units. I don't know how you model them and if you need to know the body measures? So, please give me some insight. Remember, I am a developer (programmer). After are done with the unit so units in this step are similar statue, don't have animation so you need add each action. and we have same body type with different clothes types... is long task. And mostly heavy for an artist. I'm not sure how many times take enrique finish with a set, we starting speak about this in 2014 and we aren't done yet. So why I'm asking if that is so important. @Lion.Kanzen So, basically you use the same size/height for all units. They look different for each civilization. This way you can reuse animations for units. Is this correct? Very nice. perhaos more or stronger player color? Yeah, I need to desaturate and lighten the strips I have, and find another way to introduce more into the texture pack, perhaps textiles? I honestly thought this stuff was going to be player color. 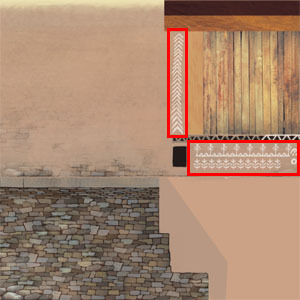 Makes sense since the orther civ textures do the same thing with these kind of detail. I'm going to jump to dropsites and military buildings, in the meantime I was wondering what I should be looking at in terms of coming up with a design for the Civic Center, as I understand it now, it will likely look like a large long manor house with a CC-sized courtyard? Or will it have a lot of Egyptian influence? Wow, really amazing! I have no real comments on this… They look both Kushite, and in line with the general feel of the game. These models feel like they've always been a part of the game… My mouth is watering at the sight of them! @wowgetoffyourcellphone Yes, the designs might be a good idea for the player color… This would allow slightly more whitish buildings, as the designs would stand out more in the player color. 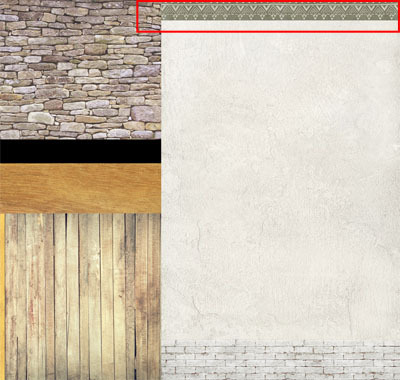 I also like my own texture attempt, but the (lower) design LordGood used is actually from a (non-whitewashed) Nubian house (15e). I described it as contemporary, but it's actually on the grounds of the Nubian museum in Aswan. It's a traditional Nubian design. Fig. 105 Details on a traditional (non-whitewashed) Nubian house in the Nubian Museum, Aswan. @LordGood Check out the governors palace at Karanog (fig 14). Fig. 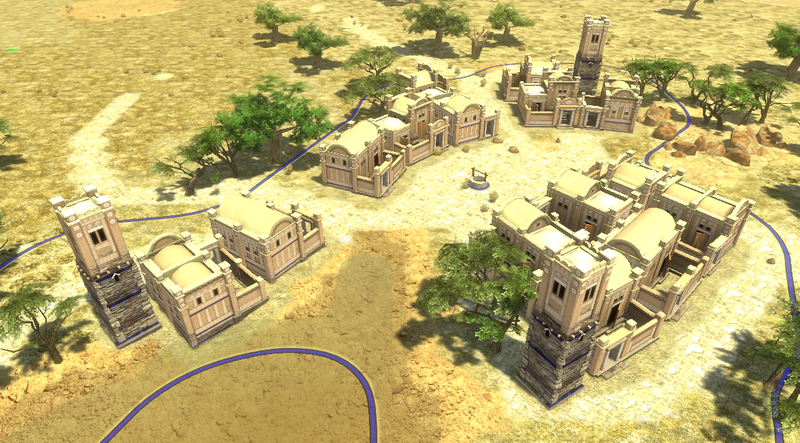 107 Meroitic governors' residence at Karanog (left), and palace at Wad Ben Naqa (center) and Naqa (right). These are literally town centers. Fig. 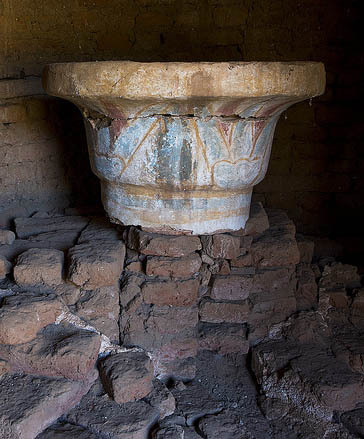 108 A well preserved example of a Meroitic papyrus capital from the Royal baths at Meroe, which would have topped a column (pillar). Would be nice for an entrance portico. @LordGood All buildings/units which @Sundiata or myself researched are described in our specification (https://github.com/Jeeppler/kushites_mod/blob/master/docs/build/specification.pdf). Not everything is added yet, but I try to keep it updated. You can always have a look at the specification for an inspiration of what to model next. @LordGood Could you render images for the tower front/back and the house variations front/back? So, I can add them to the specification and mark them as "modeled". @LordGood Do you want to be added as a contributor to the "Kushites Mod" GitHub Repository? @Sundiata We could, for example, use "Fig. 32 Cerimonial walls in Musawwarat es Sufra" as model for a "Low Wall". What do you think? Civic Center should definitely be Egypt-inspire. Have nice white obelisks, monumental statues like pharaohs, but black Kushite figures instead of brown egyptian figures. I really appreciate this project. Historical RTS games have transmitted a lot of learning desires, but the most famous of them are basically eurocentric view. Showing African cultures being more than loincloth warriors it's very important. A pity that African Kingdoms and Rise of Rajas have been released this years. There's no conscience of the effects that could have had if that expansions had been released when the original AoE days. Back to topic, what about army? That is one of the main reasons why I like the 0 A.D. project so much, the specific names, history blurbs, and relatively diverse selection of civilizations have an added educational component. Indeed, which is further exacerbated by the fact those who already have AoE2 and AoM don't get the new expansions unless they upgrade to the new version. I agree completely. The educational aspect is important. When dealing with classical antiquity, there is a lot of Mediterranean-centered tunnel-vision. 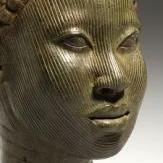 But 0AD does quite a good job of showcasing ancient diversity in cultures and civilizations. To be honest, I didn't even know about those AoE2 expansions until after I started reading about the Kushites for this project. I'm glad they eventually added them, but they were 16 years too late… In addition, those factions look wildly inaccurate. The 0AD community has already proven that they can do a [far] better job! @balduin I'll have to do a little more research, but I think you're idea's for the low wall are good. @av93 Because the Meroitic language hasn't been deciphered yet, there are a lot of unknowns about the internal organization of Kush. This makes it a bit difficult to get info on the exact composition (or terminology) of armies, but we do know enough to create an extensive unit roster, based on reality (descriptions [the occasional non-meroitic text], historical depictions like reliefs and archaeological finds like weapons). @Tomcelmare Hi, thank you for joining the discussion! I have to disagree though, on a pyramidal brown roof for the CC. The Kushites had actual administrative centers, and we know where they are located and roughly how they looked like. They all follow a specific pattern. Large, nearly perfectly square, multistoried compounds, built over large vaulted cellars, with a central courtyard or light-well, lined by a colonnade, with columns topped by "papyrus shaped" capitols. Built using a combination of mud-brick foundation (plasticity equals stability), fired red brick, cut sandstone, and white lime-plaster (perhaps mud-plaster in some cases). Vaulted ceilings were common, arched windows for upper floors as well. Fig. 109 I recently found another example of a large 2 storied Kushite palace, with more archaic features. I didn't share it before, because I can't find the source of this picture. All I know is It came from a forum discussing Kushites. Perhaps Amanishakheto's palace at Naqa? I'm confident you'll come up with something nice… Artistic licenses will always have to be taken to some degree. I'm just being as specific as I can, so that it becomes clear what we know, and what we don't. CC is a known, so it doesn't need all that much interpreting.